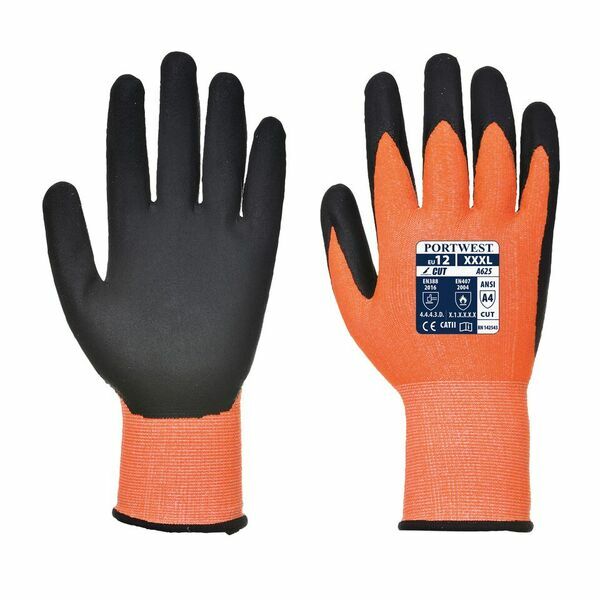 Designed to be versatile, the Portwest Hi-Vis Cut-Resistant Orange and Black Gloves A625O8 offer outstanding cut and heat resistance while ensuring longevity. A comfortable inner liner is perfect for extended use, while the dexterity of the gloves is ideal for industries such as building, fabrication and glass manufacture. The Portwest Hi-Vis Gloves are available in four sizes that should suit the hands of most users. Please measure the circumference of your hand around the knuckles (excluding the thumb) with your hand open and your fingers together, and the length of your hand from the tip of your middle finger to your wrist.